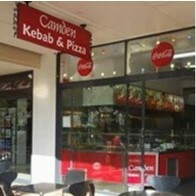 Camden Kebab and Pizza joined our Mission to help provide access to “Clean Water for All by 2030”. This Mission was initiated by the United Nations. A big thank you to Camden Kebab and Pizza’s team and customers for joining this extremely important mission on 27 November 2017. "If you're looking for a spicy gourmet pizza at top quality; look no further! Cheap gourmet pizza, ordered a spicy pizza lovers and requested their freshly home made chilli sauce (made in store) as the base, and requested extra chilli flakes and asked them to make their "most spiciest pizza they ever made" and these guys didn't disappoint. Been here a few times and never been disappointed. Their kebabs are also top quality and good value for money. I'd highly recommend this place to anyone."